Tips for catching the best Magikarps in Magikarp Jump. There will come a time in Magikarp Jump where players will need to get a new Magikarp. Perhaps the Magikarp died, retired, or simply evolved into Gyarados. Whatever the case may be, players will eventually have to fish for more Magikarp. While there are various ways to level up your Magikarp to improve its stats, you might as well start with one that has good stats already. This guide will help players get the best Magikarp in Magikarp Jump. The key to getting the best Magikarp in Magikarp Jump is to pay close attention to their individual stats. Each Magikarp will have its own stats, but some will also come with an Individual Bonus. Some Individual Bonuses offer an increased JP earning percentage, while others can increase the chances for Special Events to occur. This also gives you an idea of how to go about training that Magikarp. When you catch a Magikarp, take note of its Individual Bonus stat so you can effectively train your Magikarp and help them improve. Roddy will also comment on the stats of your newly-caught Magikarp, which can help give an idea of what stats to look for. If you catch a Magikarp with stats you don’t like, you can toss it back, but this can become costly over time. However, if you’ve got some extra Diamonds saved up, you can probably afford to be picky when trying to get the best Magikarp. A Magikarp's Individual Bonus can help you decide whether its the best Magikarp for you. As you catch new Magikarp in Magikarp Jump, you’ll also notice that they will come in various patterns. Although the patterns on each Magikarp are purely cosmetic, they can indicate whether the Magikarp is new to your collection or not. 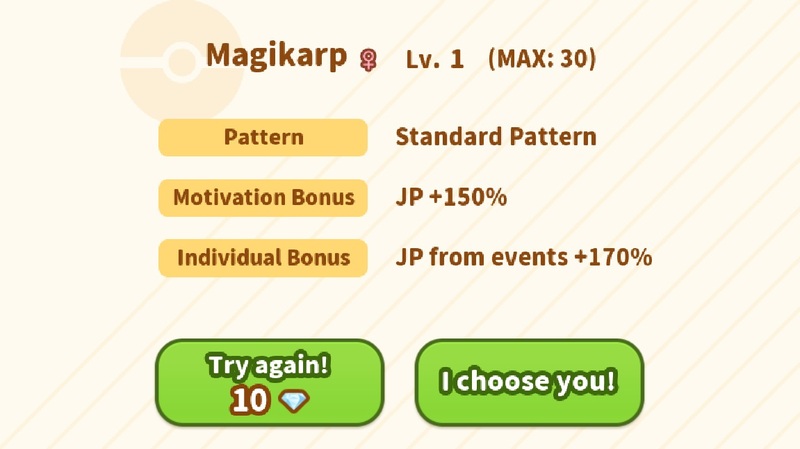 Catching Magikarp with different patterns can potentially help you complete certain challenges that will reward you with Diamonds, Coins, or other items that can be used to improve your Magikarp later. That's really all there is to it. Once you get a Magikarp that you're happy with, you can add decorations to your pond to help improve your Pokemon’s jumping power as you prepare for training. This may cost extra Diamonds, so make sure you save up more Diamonds than usual before purchasing such items. You can also evolve Magikarp into Gyarados, but you probably won't want to do this with your favorite Magikarp unless its ready for retirement. If you pay attention to the design and stats of each Magikarp you catch, you should be able to get the best Magikarp to start training for leagues in Magikarp Jump.